Pirelli design leads to the creation of the Pirelli Cinturato. Naturally, this tyre was created in the 1950s. Therefore, and was originally made from a textile belted construction. So, this tyre gave great comfort and road holding qualities.But as for all textile construction tyres was a little low on mileage. Of course, and could not compete with some of its rivals. Namely Michelin who were streets ahead with their steel belted X range of tyres. 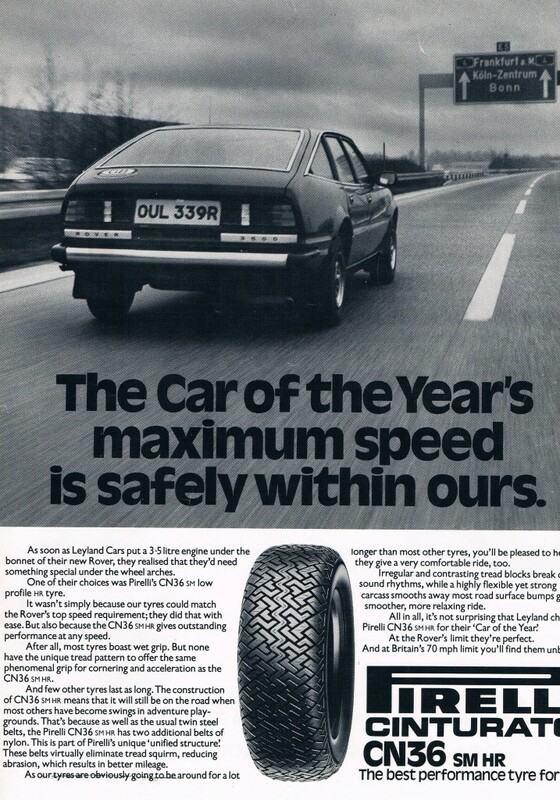 Hi i love to show off my old tyre adverts this Pirelli Cinturato advert is no exception. Of course, the Pirelli Cinturato Tyre range have been in use since I was a tyre fitter. Unfortunately, way back in the in the early 1970 s. Consequently, this type of tyre was a popular choice. Especially on the MGB sport cars and Alfa Romeos. Significantly, the most popular size was 165×14 radial tyre. But the tyres were used on many Italian imported cars in those days such as Fiats which were fitted with the Cinturato tyres. It all kicked off, when Rover brought out a car with a 3.5 litre engine under the bonnet. To balance the car out with a new type of suspension, the knew that they would have to use radial tyres. The Rover 3500 was to come out with Pirelli Cinturato Tyres fitted as one of the original equipment tyres. The Pirelli Cinturato Tyres came out with a twin steel belt and a further belt that was made out of Nylon. Nylon was a fairly new material back then and was renowned for its strength and elasticity. The Pirelli Cinturato Tyres, was known to us as the CN 36 and was remembered for its strange looking tread pattern. The pattern was almost like a winter tyre pattern. Because it had a steel belt it was always going to give the driver a good mileage on his car. In my opinion the block like tread pattern would have been very noisy on certain roads, as i say it looks more like a winter tyre. In fact i can remember some of our customers complaining about the Pirelli P4 Tyres. So,being on the noisy side. The Rover 3500, also cam out on Dunlop tyres, and these were said to have a quieter ride. The Dunlops had a rib pattern around the tyre circumference and so drove much quieter. Pirelli have these days been famous for their involvement in the F1 motor racing scene. Of course, also keeping up with the tyres for modern vehicles including the run-flat tyre range. This follows to a previous article by me? This is a great idea. Hence, to enhance the look and colour match with your car.Accordingly, this Italian police car looks great. As a result, I do think that this will become successful. Colour matching will be a thing of the future. Consequently, I am very upbeat about the new tyres. Of course, we have all seen the colour coordinates that are visible on the F1 racing cars. As an entrepreneur, I am always looking for something different. Especially, in the tyre trade. For this reason, I am always happy when new things come onto the market. I am not sure how these tyres will be marketed. Hence, I presume that they will have to be ordered specially? Pirelli has unveiled its plans for smart tyres. Therefore I am all for tyre development. Especially, the idea of your tyres sending back messages. Hence, about important things, such as tyre temperature and possible loss of tyre pressure. This technology is already used. 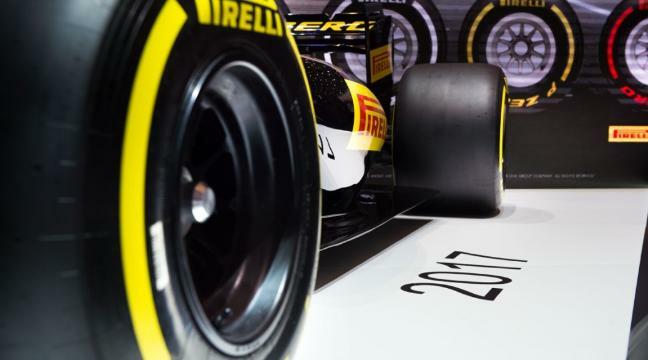 As a result, I suspect that most of these developments have come from the Pirelli tyres involvement in the F1 racing scene. In conclusion, Pirelli are going down the right road. These tyres will be rolled out on the supercar range of luxury cars. I suspect, that other car models will follow. Lastly, I really think that these tyres look special and with the correct wheels will make cars stand out in the crowd. This announcement, will be great news for the Pirelli employees in Carlisle Cumbria UK. Almost all the tyre production. Hence, here in the UK was shifted abroad to both Europe and China. Consequently, this only left us with a couple of tyre production plants remaining. Indeed, this came at a time when all British industry was watered down. In my opinion the auto trade in general was badly affected by job losses. Britain was to become a service industry. Massive swayes of industry were closed down and relocated to other countries. I suspect that it was all part of the EU’s plans to dumb down the British economy and weaken our position. Undoubtedly, as one of the world’s greatest innovators. Thus, when it came to engineering and manufacturing. As a result of the dumbing down, we have being left with vast areas of waste and derelict land in places like Sheffield here in south Yorkshire. Once the greatest steel manufacturer the world has seen. This is one of the reasons that so many people voted for Brexit. Anyhow good luck to the people of Cumbria and let’s hope that we can now attract many more engineering and manufacturing companies back to the UK. Pirelli has been given the go-ahead to expand its Carlisle factory, in a move the firm says will secure almost 4,000 jobs. Sometimes, you can read a headline, and think wow, surely that can’t be true.Consequently, this headline hit me straight in the face. Specifically, 3500 tyres is a lot of tyres. Of course, it would enough stock to start two or three medium size tyre depots. These tyres as I understand are just allocated for the F1 car testing. Therefore, not even for the actual racing. Pirelli, along with the other major tyre companies. Regard this huge amount of investment as a necessary cost.In other words to sell tyres, to us the general public. Indeed, Pirelli would also take hundreds of tyre technical staff. Hence, to evaluate the different effects of their tyre compounds.Because, I do believe that the number of compounds could be moved from three to five. Of course, it is true that over the past years that Pirelli have sponsored F1 tyres.Then other products have evolved. Without doubt, thes must include the Pirelli P Zero range of tyres. Including, the “supercar tyres”. Of course, I am convinced that the tyre trade are not targeting the young drivers. Especially when it comes to teaching about tyre safety. As the owner of Pellon Tyre in Halifax UK. I am finding it more common for young drivers, to be making tyre related mistakes. Naturally, that only slight observations would correct. Including running on tyres that are completely bald and well over the legal limit. Many young drivers including married and single people. Consequently, do not appear to or just do not want know anything about the car. Especially the tyres? This brings me back to winter tyres. Any driver who fits winter tyres on a regular basis, knows how much safer it is to drive about in winter weather. Even in heavy rain, the driver will feel much safer, with a good set of winter tyre fitted to their car. You can handle anything that an British winter can throw at you. Some of these young drivers are driving about without any tread on their summer tyre, never mind winter tyres. These drivers are also the ones that take the risks on bends and speeding on our roads. This combined with bald tyres is a recipe for a disaster. Unfortunately this is what happens. How often do we see a car on its roof in a ditch? too often, many would say. So lets target the young drivers with more education about tyre safety and the use of winter tyres. Here at Pellon tyres. We have noticed that the vehicles that are most affected by bad weather. Hence, in winter are the SUV vehicles. As a result, these cars have been fitted with very large and wide tyres. Thus, by the car manufacturers. Because these cars are at the luxury end of the car market. Requiring them to be a quiet and comfortable ride. Pirelli tyres are not known for their winter tyre products here in the UK, but it is a growing market all across Europe and it is a market that they would like to be part of. This Snow patrol 3 tyre will definitely help them achieve this in the winters to come in my opinion. https://www.pellonautocentre.com/wp-content/uploads/2018/01/winterizeyourcar_medium.jpg 396 630 Eric https://www.pellonautocentre.com/wp-content/uploads/2015/06/Logo_PellonCleanTrans.png Eric2019-01-06 16:19:422019-01-18 13:10:59Pirelli Winter Tyres- Pirelli recommend that UK motorists to fit "WINTER TYRES"
Pirelli tyres have brought out this new winter tyre the Pirelli Snowcontrol 3 to try boost its standing in the winter tyre market. The giant tyre company has good standing in the home market in Italy, but slips behind in the UK and the rest of Europe. Pirelli tyres have brought out a next generation of winter tyres. Thus, the Pirelli Snowcontrol 3. So to follow in the footsteps of the of the snow control 2. This new tyre. Therefore, has the advantage of having a greener credential than its predecessor. Most of the leading tyre makers. Consequently, are now going down this line. Most tyres are made of large amounts of oil based materials. For this reason, the shift is now to use materials that are not petroleum based. As expected, use other types of oils. That are much more environmentally friendly. This Pirelli Snowcontrol 3 winter tyres. Naturally, from Pirelli are classed as Eco-compatible. Therefore, will have a minimal impact on the environment. Thus, without effecting the performance. These Pirelli Snowcontrol 3 tyres. Have a special directional tread pattern. Hence, with wide central grooves that to optimise pitch sequence. Of course, that enables them to be much quieter and reduce much of the road noise that were once synonymous with winter tyres that were once a stumbling block for many motorists. In fact this tyre already complies with the new 2012 EU directive on the lowering of road noise it I also perfect for use in mild and extreme weather conditions, anything that the European winter can throw at us. The Winter Pirelli Snowcontrol 3 offers greater traction on snow and ice while also improving grip in dry conditions, thanks to its wide lateral channels and directional tread pattern. Pirelli has extended its range of seasonal tyres in order to meet the needs of a market that increasingly prefers products that ensure a low environmental impact and lower fuel consumption, but without sacrificing safety and comfort. This is another Pirelli article. Hence, about the engineering techniques involved in designing their tyres. As a result, of their expertise and involvement in the motorsport scene. Strangely enough, we do not have much of a call for Pirelli tyres here in Halifax UK. Of course, many of the Pirelli tyre these days are fitted to what I call the “upper class” supercars. Naturally, from Porsches to Aston Martins. Our customer base, although strong drive about in lesser cars. Of course, we do get some of the more expensive cars, but not that many? Because of their involvement in the F1 race scene. Then Pirelli have developed tyres for the new development of supercars, that are on the luxury car market. Therefore, we do not get much input and sales for the new input of Pirelli P Zero tyres. This article is interesting and worth a read. This is another great article from Pirelli tyre. Hence, about the sometimes complicated decision. Thus for the motorist, when buying different types of tyres. In my opinion Michelin complicated matters. Claiming that their CrossClimate tyres were”summer tyres” that could also handle some winter weather. Previous to this we only had winter tyres summer tyres and all-weather tyres. All-weather tyres were winter tyre, that could be also used in summer. Both the all-weather and CrossClimate tyres are aimed at countries that do not have extremes of weather. Hence these include countries in southern europe, such as Spain and Portugal. Although this winter has been very extreme in these areas, with snow falling in the Costa blanca. Here in Halifax UK, we have had a cold but only a few snowy periods. However, drivers in the area of my tyre depot, tend to go for the proper winter tyres and not the “inbetweenies”. Of course, we do have many hills with high elevations. Making it important to have the correct tyres fitted. So not to get caught out and stuck in the snow.